Though we didn't have a full new Legend of Zelda adventure to enjoy this festive season - unless you just started Tri Force Heroes - such is the depth and history of the franchise that there are plenty of titles to take on when on holiday. It's one of Nintendo's most treasured IPs, and a definitive part of pop-culture around the company. If you want to sit back and enjoy a bit of a history lesson and assessment of the first game in the series, the following video from The Game Theorists is worth watching. 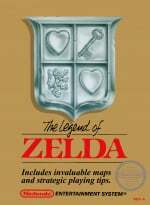 It looks at a great deal of the background of the NES title's creation, and also serves up some analysis around the lore and structure of the title. Good video. Saw it yesterday. "the following video from The Game Theorists"
oh, thought it might be something interesting. @Tsurii Too much salt isn't good for you. @Tsurii you obviously didn't watch it. It's a guest and it's a short history not a theory. My favorite game (hence my avatar) and a good video. Really enjoyed it! Great games and one of the first things that comes to mind when I hear the word Nintendo. Good video, interesting the 'Link' name origin. Great video Legend of Zelda is definitely an iconic game loved playing this as a kid.